So far, my publishing achievement is only in one book but I must say, I was more than thrilled when I was told that they had chosen my paper for publishing. 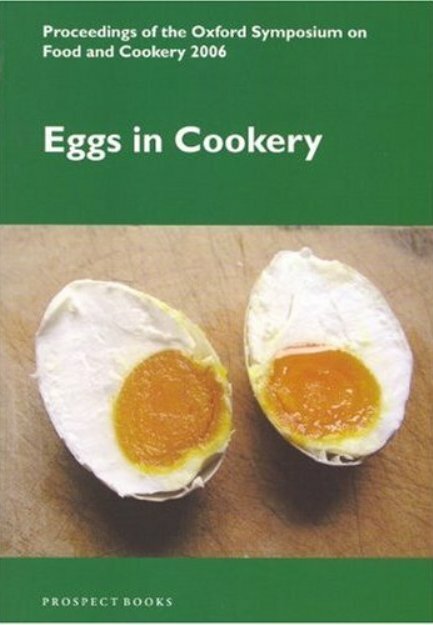 In 2006, I was chosen to present a paper at the Oxford Symposium on Food & Cookery at St. Catherine’s College, Oxford on the topic of eggs. My girlfriend came along to the symposium (thank goodness, the moral support was great) and we met the “who’s who” of the food writing industry such as Jeffrey Steingarten, Claudia Roden, Raymond Sokolov, Barbara Wheaton and Prof. Hervé This (who advises Heston Blumenthal) gave an awesome and comical presentation. Needless to say, it was very interesting (albeit a little intimidating at first) and very inspiring to be surrounded by so many food academics. I guess I could count my Master’s thesis as “published” – well, it’s housed in the University of Adelaide library for other students to look at if they wanted to…haha. The hardest thing I’d ever had to do is called: Sauternes with Oysters, Champagne with Everything: The Evolution of Wine and Food Pairings. It is an initial study into the history of dining and the pairing of wine and food, focusing mostly on nineteenth century evidence. 25,000 words…give or take a few. Food academics? Was Marion Nestle there? She’s my favorite food nerd. No she wasn’t there that year but she did come to the Univ of Adelaide as a guest speaker last year to speak to the current gastronomy students about the new food studies program at NYU. We introduced ourselves and told her what we wrote for our dissertations and etc…She was nice but didn’t get to spend enough time with her. One of the nicest people I met at the Symposium was Claudia Roden – have you read her Jewish food cookbook? Amazing.